This is an older freezer cookbook from 1968. A gem for classic cookbook lovers, not recommended if you take offense to writing that implies women should be in the kitchen and prepare every meal for their husbands and children. As would be expected from a 60’s cookbook there are no pictures. 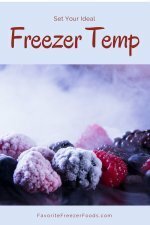 That said The Freezer Cookbook does not focus on the economies (money saving aspects) of freezer cooking but the time saving techniques that a freezer enables. Charlotte includes tips on arranging your kitchen and basic cooking techniques both for the freezer and for general cooking. With 411 pages this book has a lot to offer. The book is well laid out with intuitive chapters and has a thorough index to help you find anything you need. The recipes are from scratch with basic, common ingredients. There are a few that call for a can of condensed soup or some baking mix but most don’t. All the ingredient lists are offered twice or more, first as a single batch and again in a larger quantity. There is the occasional old fashion slang such as ’slow oven” but most recipes include oven temperatures, prep time and yield. 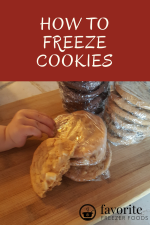 Not all the recipes have freezing instructions in the directions so you’ll have to do some thumbing around to the proper section to learn to freeze things your unsure about. From breakfast to dessert this book offers everything. Dinner main dish or side dish, for company or family, beef, pork, veal, turkey, chicken, fish or vegetarian this book is full of classics that can inspire todays home cook as easily as those of the past. The Freezer Cookbook is a complete package for new or experienced cooks from learning the basics of cooking and learning to freeze food to more advanced dishes this book has everything you need. Read other cook book reviews. Return from The Freezer Cookbook to the homepage of Favorite Freezer Foods.